Happy first anniversary to The Wizarding World of Harry Potter – Diagon Alley at Universal Orlando, which opened one year ago on July 8, 2014. 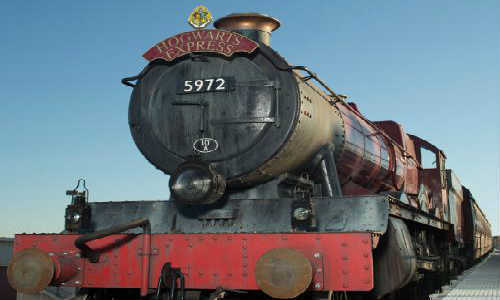 An extension on the popular The Wizarding World of Harry Potter – Hogsmeade, Diagon Alley not only offered all new Potter experiences, but introduced Hogwarts Express, which connects the two Potter worlds. 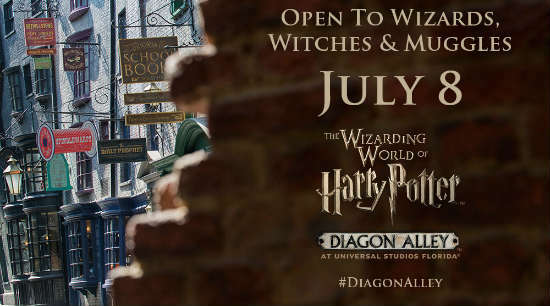 One of the most asked questions of the Orlando summer – “When will The Wizarding World of Harry Potter – Diagon Alley open?” – finally has an answer: July 8. Universal Orlando made the announcement in a morning press conference. This date is later than many fans originally thought, but purchasers of special Universal Vacations packages are guaranteed admission to Diagon Alley, even if their travel dates fall before July 8. There will also be soft openings at random times prior to the official opening day. Once open, fans with a 2-park pass will be able to travel between Diagon Alley and Hogsmeade via the Hogwarts Express train. How fun will that be – you never have to leave the HP realm the entire day, if you don’t want to. 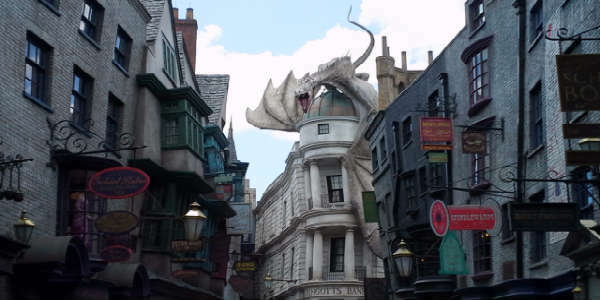 Are you looking forward to the opening of Diagon Alley? It’s only a few weeks away. Universal Orlando has announced they will air several webcasts this week that will preview the Wizarding World of Harry Potter – Diagon Alley attraction that will open this summer. Wednesday evening (6/18) there will be a live webcast from the red-carpet event, with appearances from several stars from the Harry Potter films. This webcast will begin at 8pm and is expected to last an hour. Thursday (6/19), at noon, Universal will webcast “All Aboard: A Journey on the Hogwarts Express with Oliver and James Phelps.” The Phelpses played the Weasley twins in the movies, and they will take a tour of the new Hogwarts Express train that will connect Diagon Alley in the Universal Studios park with the existing Hogsmeade attraction at Islands of Adventure. The webcasts conclude on Friday (6/20) at noon with “Behind the Bricks: A Tour of Diagon Alley with Tom Felton, Matthew Lewis & Alan Gilmore.” Gilmore, the art director of the films and both sets of Wizarding World, will show off details of Diagon Alley, with help from actors Tom Felton (Draco Malfoy) and Matthew Lewis (Neville Longbottom). For more details on how to watch these webcasts, visit UniversalOrlando.com. Last night was the broadcast of the first of a week of episodes of The Tonight Show with Jimmy Fallon filmed at Universal Orlando. 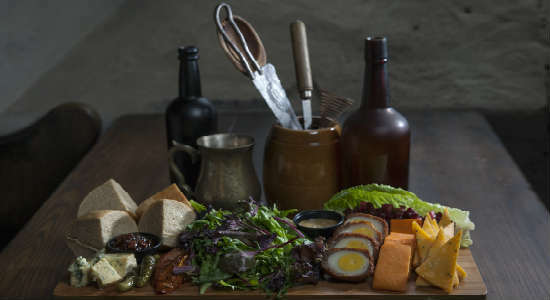 One of the most anticipated openings in Orlando this summer is The Wizarding World of Harry Potter – Diagon Alley, and this week Universal Orlando released details of the new area’s food and beverage offerings. We have big news to reveal, as it was announced late yesterday that The Tonight Show with Jimmy Fallon will be taping new shows on location at Universal Orlando in June! The show will be taping June 16-18, 2014, and some of the guests already announced include Jennifer Lopez, Pitbull, and Tracy Morgan. Even more exciting is the shows will offer a first look at the brand new The Wizarding World of Harry Potter-Diagon Alley attraction at Universal Studios park, as well as the Hogwarts Express train that will connect the two sides of the Harry Potter attraction. It’s getting closer to the opening date of the new Diagon Alley section of Universal Studios, so Universal Orlando has released a short teaser video of the inside of Gringotts Bank, as well as concept art for load area of the ride. These animatronic goblins populate the bank inside the Harry Potter and the Escape from Gringotts attraction that will be the centerpiece of The Wizarding World of Harry Potter — Diagon Alley. According to Universal, more details will be released May 13, 2014. This week, Universal Orlando released new details about the Hogwarts Express train that will connect the two areas of The Wizarding World of Harry Potter with each other. The train will shuttle guests between the new Diagon Alley in Universal Studios Florida and Hogsmeade in Islands of Adventure, but it will also be a heavily themed experience that Potter fans will love. The Hogwarts Express experience combines powerful storytelling, live special effects, lifelike animation and state-of-the-art technology to take riders on the journey of a lifetime. 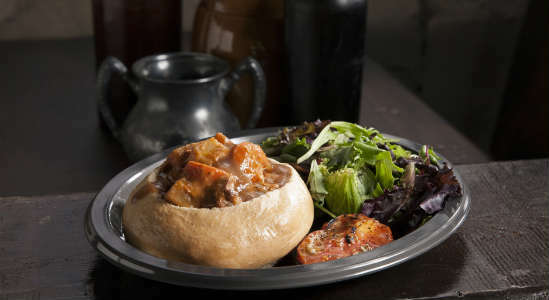 Guests will enjoy two completely different experiences depending on whether they’re traveling to Hogsmeade or London (Diagon Alley). In an online webcast yesterday morning, Universal Orlando revealed more details on the new The Wizarding World of Harry Potter – Diagon Alley attraction that will be opening this summer. Diagon Alley will be located within Universal Orlando’s other theme park, Universal Studios, and will create new experiences based on the signature areas of London, Diagon Alley and Knockturn Alley. 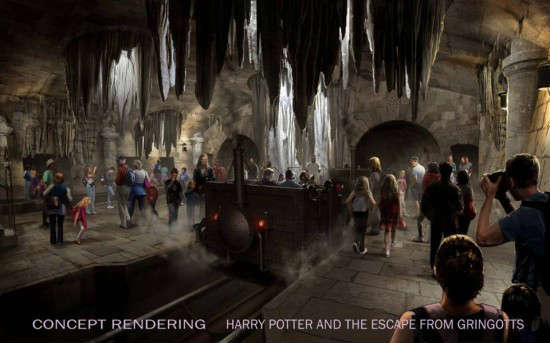 The main thrill ride in Diagon Alley will be called Harry Potter and the Escape from Gringotts, and it will place riders in the middle of an incredible adventure as they navigate their way through the perils of the Gringotts vaults. Universal says this will be a multi-sensory, multi-dimensional ride. Sounds incredible! Harry Potter fans from around the world will convene at Universal Orlando for A Celebration of Harry Potter January 24-26, 2014. Headlining the event will be actors James Phelps and Oliver Phelps who played Fred and George Weasley, and actress Evanna Lynch who played Lovegood in the eight Harry Potter films. Others from the Potter universe scheduled to appear are artist Kazu Kibuishi, who re-imagined the HP book covers, and HP film graphic artists Eduardo Lima and Miraphora Mina of MinaLima. 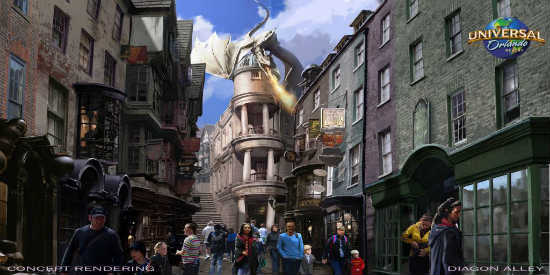 There will also be a preview of Diagon Alley, The Wizarding World of Harry Potter expansion set to open at Universal Studios Florida in Spring 2014. The VIP vacation package is sold out, but the three-day celebration is still open to any parkgoer with admission, on a first come, first serve basis. There is a Florida resident 3-day park to park ticket on sale, which offers savings over the price at the gate. For more information, go to universalorlando.com/celebration. While construction furiously continues on the Harry Potter expansion at Universal Studios Florida for next year’s opening of Diagon Alley, Universal Orlando has released a second teaser video for the attraction. Only 17 seconds long, it doesn’t reveal very much, except a short clip of what might be the Gringotts Bank thrill ride.